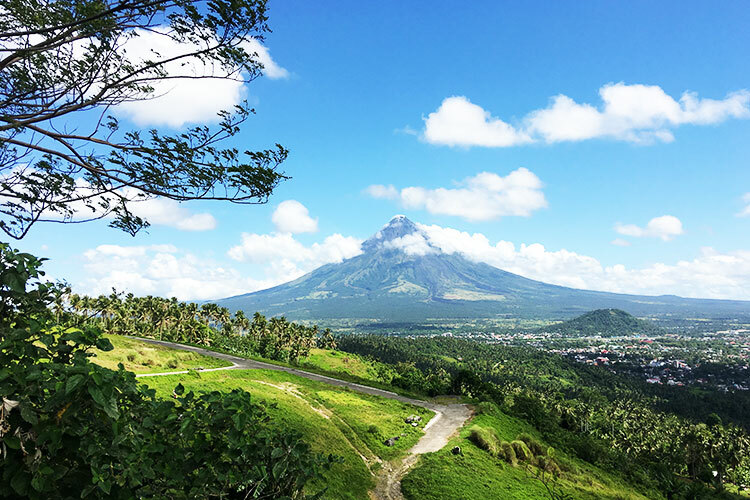 Legazpi City is the capital city of the Province of Albay, located in Bicol Region. The city can be accessed via a 12 to 15 hour Manila to Bicol road trip or an hour-long plane ride from NAIA to Legazpi City Airport. 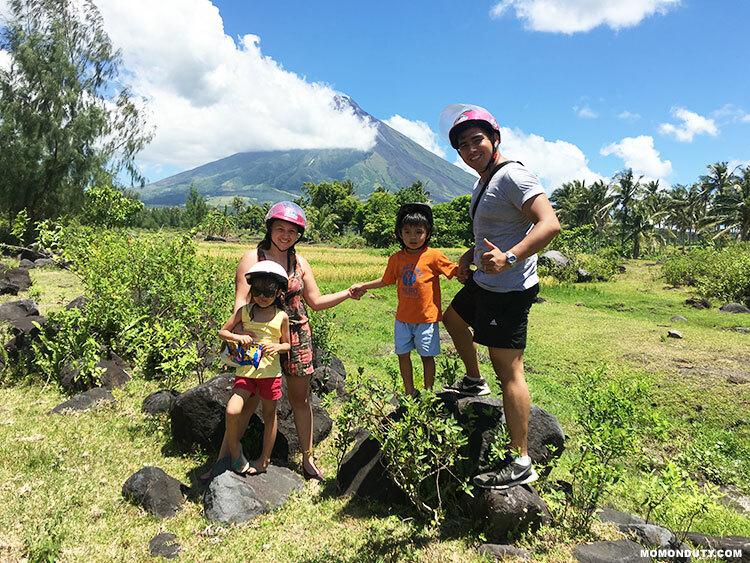 Our family vacation in Bicol was an unplanned one—just like many of our adventures. My husband’s work schedule is very unpredictable, which is why we grab any opportunity to take a trip when his schedule opens up. It is recommended to start your Bicol road trip at 12 midnight so you won’t get caught in traffic. We began ours at 4 in the morning, which is why our trip took longer than expected. Note that you will be traversing a lot of towns throughout the trip, some of which have traffic build up if you pass by during the day. So, if you can leave at night, do it! Our trip took 15 hours, but they say you can do it in 10 to 12 hours. The road trip to Bicol will take very long so bring water, snacks, and entertainment. Our car has TVs built in so we took a lot of movies with us. The radio won’t work since there is no signal most of the trip—and LTE signal is very hard to get so Spotify won’t work. Your only option? Bring movies (if you have DVD built into your car) and fill up your phone with downloaded music! We also took with us pillows and blankets for the kids. If you have little ones with you, it is best to have them secured in their car seats for safety and for a more comfortable trip. Ours slept most of the trip and watched movies or ate their snacks when they were awake. We arrived in Bicol at around 8:30 in the evening. If you can book a hotel ahead of your trip, do it. It is difficult to find a hotel last-minute (especially during the Holy Week) so book one before you go. We were just lucky to get the help of the local fire station, who directed us to a hotel with available rooms. We checked into Ninong’s Hotel Wednesday night. This hotel is right smack at the center of Legazpi City, making it super accessible. Since we took a lot of breaks in between our activities, it was very helpful to have the hotel so near all the tourist spots! Robinson’s Supermarket is right across the hotel so you can buy snacks there; while restaurants surround it so you have a lot of options come meal time. Aside from providing easy access to all areas of Legazpi City and surrounding towns, what we love about Ninong’s Hotel are their comfortable accommodation (rooms are airconditioned and the bathroom is spacious) and excellent customer service. They are quick to provide new towels and toiletries for us and are great at dealing with children who tend to get impatient while waiting for their food at the hotel cafe and restaurant. Room rates at Ninong’s Hotel start at PHP 2,500 (inclusive of buffet breakfast). But, if you are looking for cheaper options, you can book affordable Legazpi City hotels here. 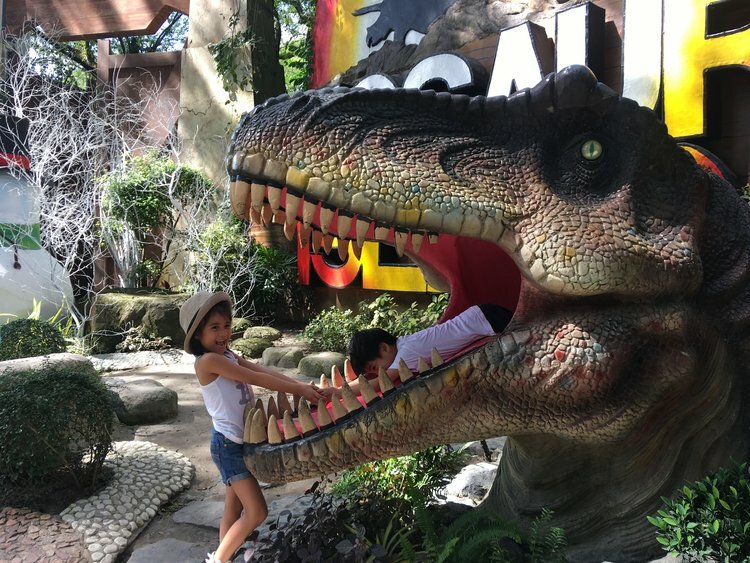 This Bicol tourist itinerary is best for families traveling with small children. If you don’t have kids tagging along, you might be able to try more activities or visit more places. 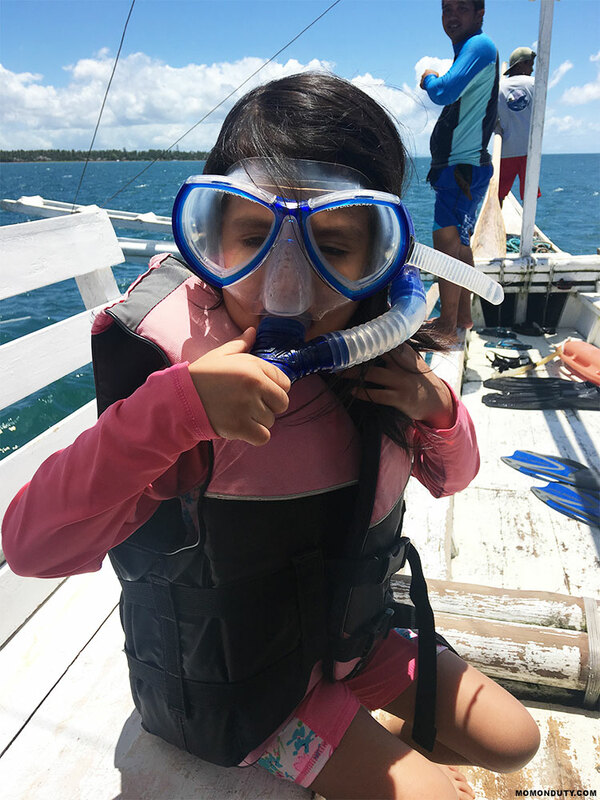 However, since our kids were with us during our Bicol trip, we had to make sure that our kids will also enjoy. 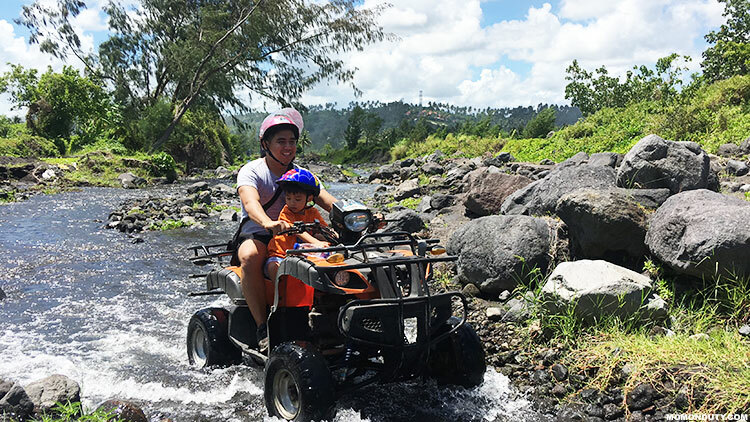 This is a must try activity when you are in Legazpi City! 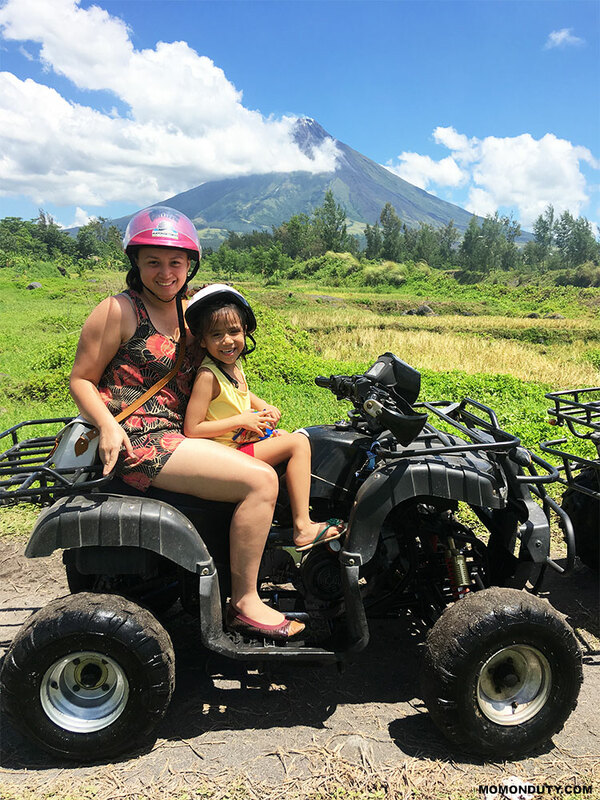 Aside from it being super fun (even for our two little kids), the ATV ride will give you a pretty good view of Mayon Volcano. This is your chance to take lots and lots and lots of photos! 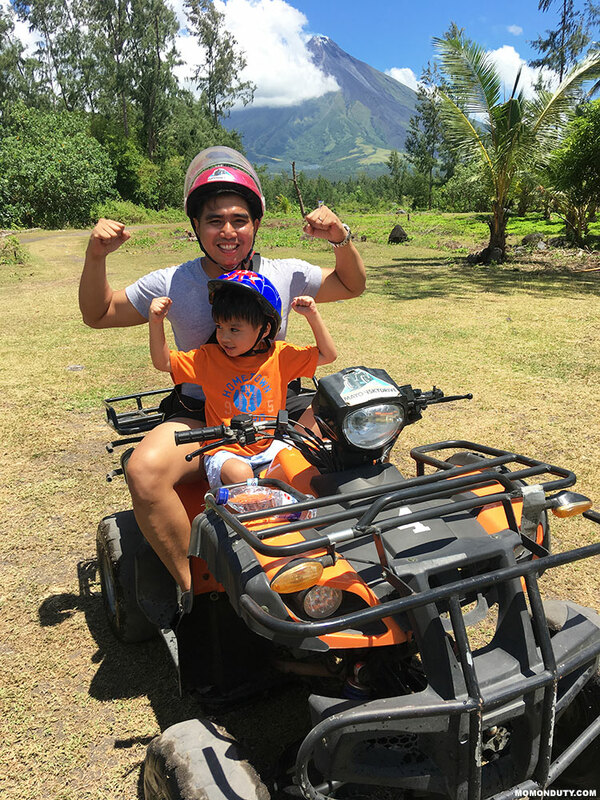 The best time to try the ATV ride in the Cagsawa ATV Trail is early in the morning so the sun is not too hot and the place is not yet crowded. If you are here by 8 in the morning, you will save yourself from the wait and the heat. Still, even if you will do this activity early in the morning, remember to bring water, put on sun block, and wear something that will protect you from the sun. We were in our summer clothes when we tried the ATV ride so we ended up with sun burn on our shoulders! 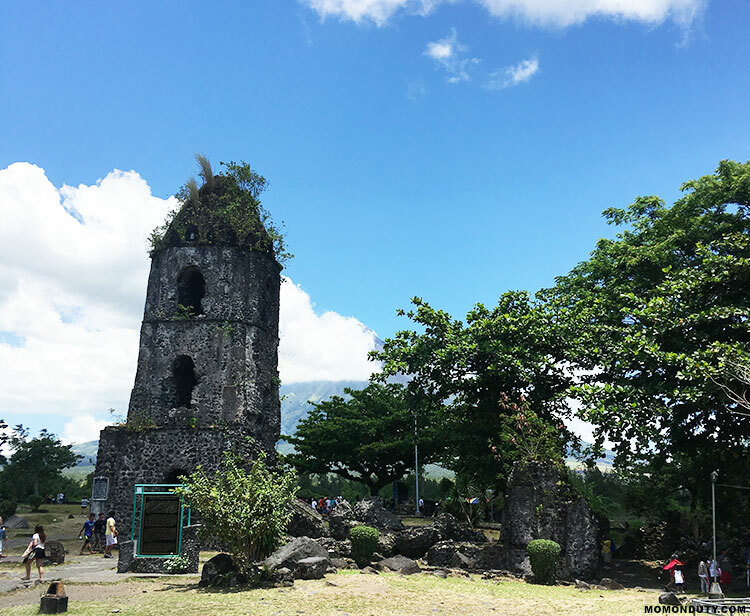 The town of Cagsawa was buried in rocks and sand when Mayon Volcano erupted in February 1, 1814. This bell tower is the only visible structure from the old town. We like to insert lessons whenever we travel with the minis. Your visit to the Cagsawa Ruins is your chance to share the violent history behind the beautiful and seemingly harmless Mayon Volcano. If you want to try Bicol’s authentic food, such as Bicol Express and Pangat, this is the place to go. Located at the heart of Legazpi City, Waway’s Restaurant serves a buffet of Bicolano food favorites as well as dishes common to the rest of the Philippines, like Kare-Kare, Nilasing na Hipon, and Halo-Halo! Unfortunately, since we went here after our scorching hot ATV adventure, we forgot to take photos of the food. Haha! #foodbloggingfail But seriously–if you want to try an array of Bicolano food, try Waway’s! Take a windy stroll along the port area of Legazpi City. 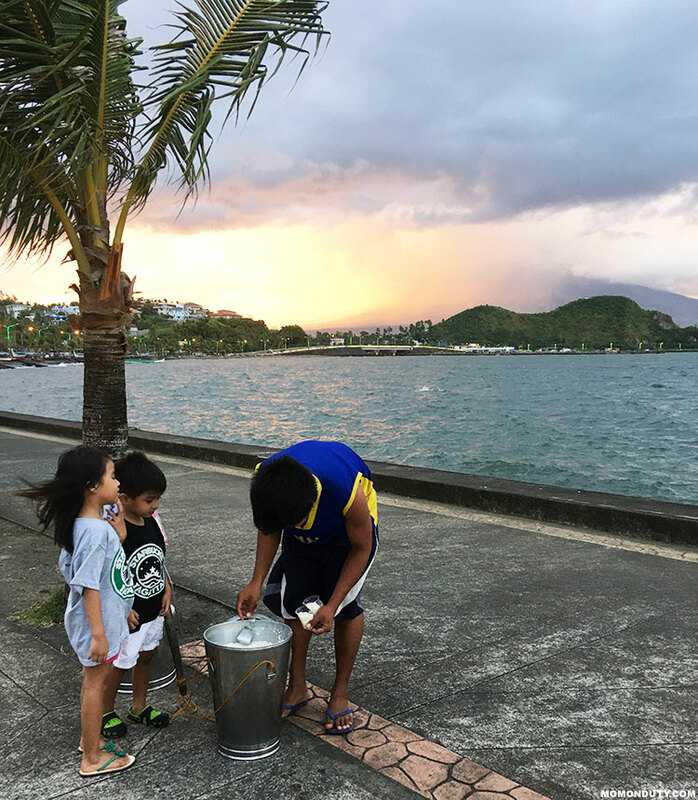 Embarcadero de Legazpi is a wonderful place to sit (or stroll) while you watch the sun set behind Mayon Volcano. There is a long line of food establishments across the port area, too, so you can have dinner here if you would like. 1st Colonial Grill is known for their Bicolano food inspired desserts. The best seller? 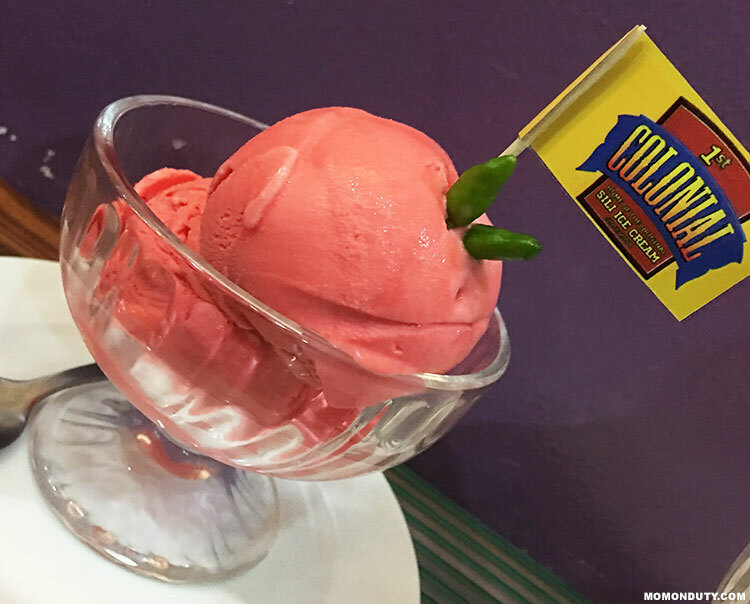 Their Sili Ice Cream (Php 89 per serving)! There are three levels: Level 1 (mild), Level 2 (this is what we tried), Level 3 (good luck!). I am not a big fan of spicy food so when I took a spoonful of Level 2 Sili Ice Cream, I was quick to grab (and finish) a huge glass of water. You will not taste the labuyo at first… until it goes down your throat. It feels both cold and hot! Donsol, Sorsogon is a little over an hour drive from Legazpi City. If you do not have a car, there is a van that goes directly to the town. I suggest that if you are already in Legazpi City, then might as well take a side trip to Donsol, Sorsogon. Our side trip to Donsol is not part of our original plan since we really intended to just stay within Legazpi City and nearby towns. It is a good thing my husband insisted that we take the side trip because the experience of swimming with the Donsol Whale Sharks is AMAZING. I mean, how often can you swim RIGHT BESIDE a Whale Shark, right?! The best time to swim with the whale sharks in Donsol is from March to May. 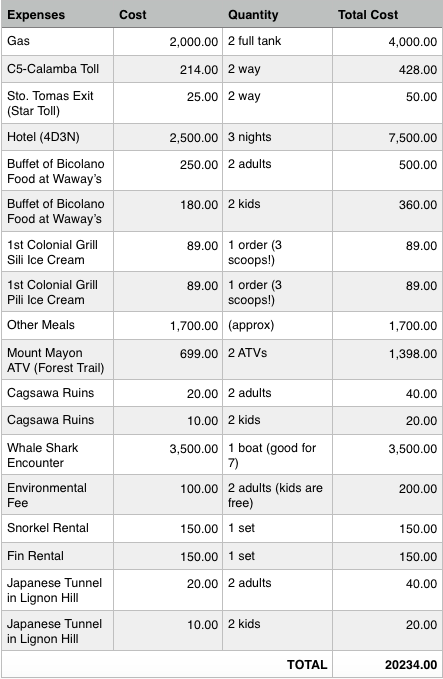 DO NOT book your whale shark encounter in Legazpi City because it is a lot more expensive there. Instead, go to Donsol then head over to their Tourist Center. From there, you just need to sign up for an encounter, pay for your boat and the environmental fee, then watch a quick video about the do’s and don’ts during your encounter. After that, you will be called to board your boat. The payment scheme is per boat, which is PHP 3,500 for a 7-seater boat. If you want to save money, look for other tourists who are willing to share a boat with you so you can split the amount. The environmental fee is PHP 100 per person. The boat fee includes 3 hours of spotting and swimming with whale sharks. However, after one hour and four whale sharks, we decided to go back to shore because the kids were getting hungry already. Lesson: BRING SNACKS. After a tiring encounter with the Donsol Whale Sharks, you will need to recharge and cool down. Miraya Dive Resort and Restaurant is just a few minutes from the Tourist Center, which is where you will be dropped off after your encounter. We brought our car to the resort since all our things are in the car, but it’s close enough to just walk to the resort. Although there are shower rooms at the Tourist Center, you can opt to take your shower at Miraya while you wait for them to prepare your lunch. Their meals start at just PHP 150 (complete with rice and viand) so it’s super affordable! We were supposed to just shower and have lunch here, but the minis insisted that we stay a few more hours so they can play by the beach. We do not get a lot of beach time lately, so why not! 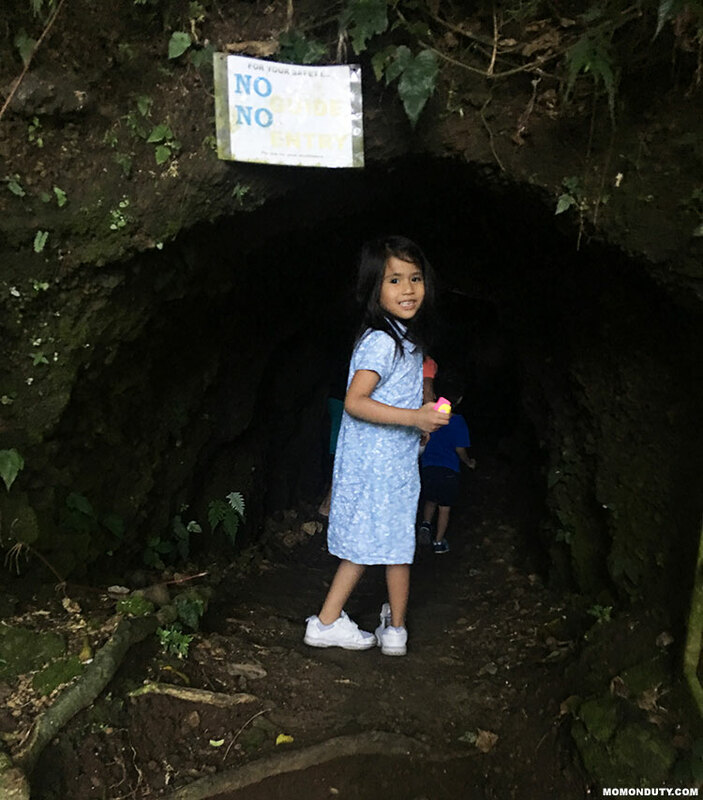 If you love historic sites like we do, then you cannot miss the experience of going inside a World War II Japanese Tunnel in Lignon Hill. The tour costs PHP 20 per adult and PHP 10 per child. It takes approximately 20 minutes. I was not able to finish the tour since our son got scared, so I had to take him outside. What to expect: It is pitch dark inside, but you will be provided a flashlight. Kids are allowed to go in, but do not force them if they are scared. It is pretty scary for little ones inside since it is dark and the space is SO small. As you can see in the photo above, the tunnel is just right for our 5-year old’s height. 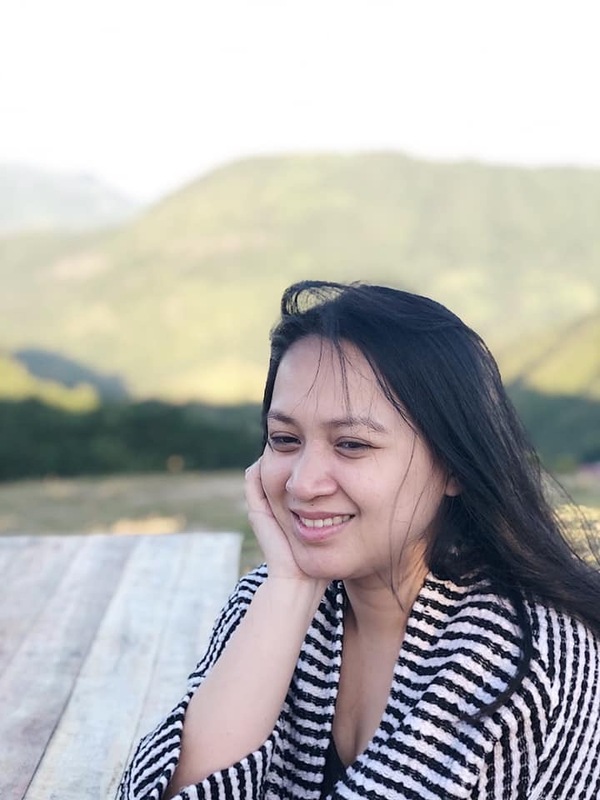 Although my husband had a grand time eating Bicolano food, which are mostly cooked with labuyo and coconut milk, the minis and I were not big fans–mainly because we are not used to spicy food. So, on our last night, we decided to eat something familiar: American food. Bigg’s Diner seems to be all over Legazpi City. There was one just walking distance from our hotel so we decided to eat dinner there. I recommend that you try their Tenderloin Tips–I really loved those! The kids, on the other hand, said they loved their Italian Spaghetti. We decided to lay low on our third day so we just had breakfast at our hotel then checked out at 11 in the morning. On our way back to Manila, we decided to visit Bicol churches. 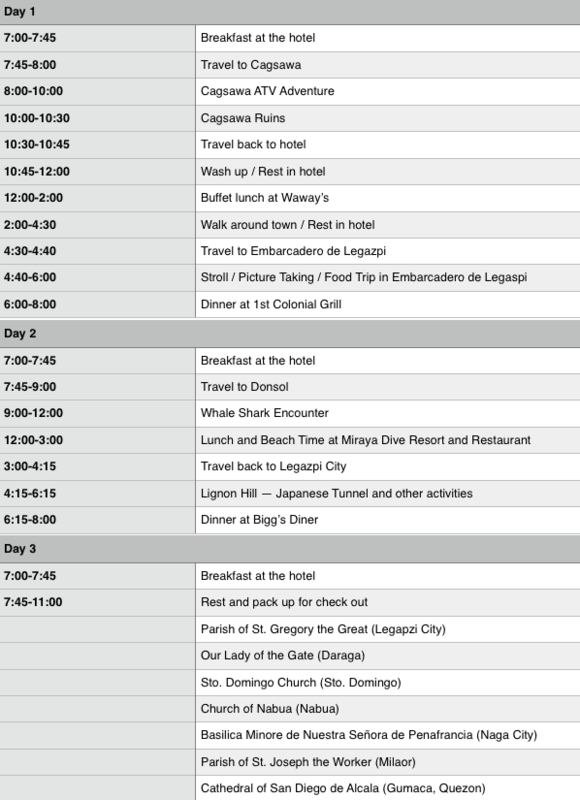 This itinerary is perfect for families traveling with kids. You will notice that we inserted a lot of rest times at the hotel in between the activities–that is because the kids will really want to cool down and rest. 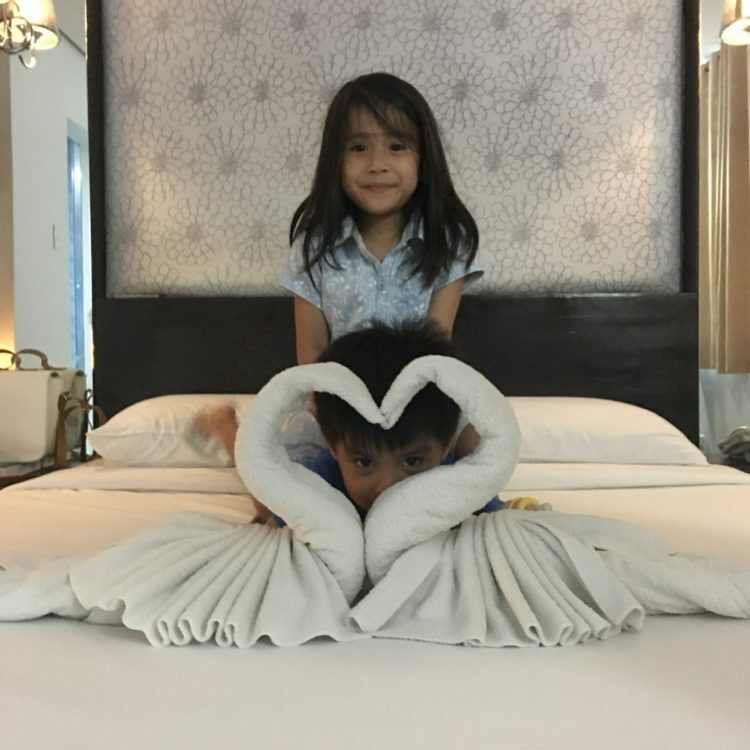 If you are going on a Bicol road trip with kids, it is best to book a hotel that is easily accessible (like Ninong’s Hotel) so you can quickly go back if the kids need to rest. This Bicol road trip budget is good for three days in Bicol. This includes prices for two adults and two children aged 5 years old and 4 years old. If you divide our budget, we spent roughly Php 5,000 per person (two adults, two kids) — food, accommodation, transportation, and activities are included. Clothes… lots of it. You will want to change clothes after every activity! It took us 15 hours going to Legazpi City. If you do not want to get caught in traffic, leave Manila at 12MN. If you do not have a car, tourist spots within Legazpi City are accessible through jeepneys and tricycles. Farther places, such as Donsol, can be reached via a van ride. But if you can bring your car, bring it. The best time to go to Donsol, Sorsogon to experience swimming with the Whale Sharks (Butanding) is from March to May. We saw a total of 4 Whale Sharks in one hour! Your boat rental for the Whale Shark encounter gives you three hours max with the Whale Sharks. The fin rental is not a must for the Whale Shark Encounter. It was actually harder for us to swim with the fins on. There are more activities in Donsol, such as island hopping. You will need one full day for that. Go for it if you have time! There are a lot of activities at Lignon Hill. We went there right after our Whale Shark encounter so we were so tired already. Hence, we opted to just visit the Japanese Tunnel. Meals in Legazpi City will cost you approximately P500.00 per meal for a group with two adults and two kids. You may lower the cost if you are willing to eat in a carenderia. The road trip to Bicol was long. We got bored to death at one point and wanted to go back to Manila, but we do not regret going ahead with the trip! Cross my heart, a family vacation to Bicol is SO WORTH IT. We only explored Legazpi City, its neighboring towns, and Donsol in Sorsogon… so we are already making plans for another trip so we can experience what the rest of Bicol offers. Dios mabalos, Bicol!!! Until we meet again. all i can say is wow …thanks for the great info. I appreciate your Bicol Tour. Really a great help for us with kids. I know!!! Try the drive to Legazpi too! You can take the plane, but there are really a lot to see on the way (which you’ll miss if you fly to Bicol). Can’t wait to check out the other places there! So much to explore!